The ownership and operation of Golding Barge Line traces its heritage in the barge business to 1965 when Thomas Golding started a shipyard and drydock service in Vicksburg known as Big River Shipbuilding, Inc. The owners of Big River Shipbuilding diversified into the operation of boats and tank barges in 1969 by forming Ole Man River Towing, Inc.
Steve Golding, president of GBL, began his river career at the age of 15 by working part time at Big River Shipbuilding. When Ole Man River was formed, Steve began working during the summers onboard the company's vessels. Upon graduation from Mississippi State University in 1972, Steve began his full time career in the tank barge industry by working as a tankerman and licensed steersman onboard the company's towboats. Steve came ashore mid-1973, and began the steady expansion of Ole Man River Towing. He led the company from a small operation to becoming a well established barge line. Along the way, he assembled an extremely dedicated and loyal team of employees. Ole Man River was sold to Kirby Corporation in 1992. 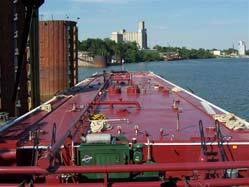 Steve re-entered the tank barge industry by forming Golding Barge Line, Inc. in 1995. He is quick to point out that the nucleus of his key employees, both onboard and shoreside are former Ole Man River employees. Most of these team members grew up in the industry with Steve and eagerly came back to the newly formed tank barge operation. Golding Barge Line has the distinct advantage of being a company with great equipment matched with a team of employees having many years of experience in the tank barge industry. There truly is no other barge company quite like this very unique and dedicated operation. Golding Barge Line specializes in the movement of refined petroleum products, petro-chemicals, and chemical products throughout the entire US inland waterway system. It has been developed into a well-established barge line, with a long heritage in the barge industry. All of GBL's boats have been custom built and are powered by CAT engines, which are proven to be the most energy efficient source of power available on the inland waterways. Its barges have been designed and built to the company's unique set of specifications. The discharge rates on these barges continue to 'break records' for the fastest discharge times at every terminal they call on. If you are a shipper looking for the safest and most energy efficient carrier to move your liquid products, you have come to the right place. We sincerely hope you will give us the opportunity to add your company to our growing list of very satisfied and loyal customers. The 3rd generation of Goldings entered the inland barge business with the addition of Steve and Melody's son Austin in 2009. Austin began working onboard all of Golding's boats immediately after graduation from Mississippi State University. Austin has grown up around the barge industry his entire life so his learning curve was not very steep. Golding Barge Line operates very much like a family of dedicated people, so it is no surprise that Austin is a natural fit in his current position as President.